Daily Illuminator: More Munchkin Guest Artist Edition Shirts! December 14, 2015: More Munchkin Guest Artist Edition Shirts! 1) The Munchkin Fu Guest Artist T-Shirt, with art by John Kovalic: Are you able to deal out Samurai-twitching pun-ishment? 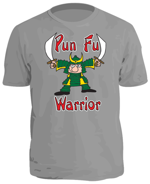 It's probably polite to warn others that you're a Pun Fu Warrior! 2) The Super Munchkin Guest Artist T-Shirt, with art by Art Baltazar: We liked the Super Munchkin Guest Artist Edition cover illustration by Tiny Titans' Art Baltazar so much, we turned it into a shirt! It's hard not to feel super with this shirt on. 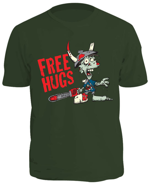 3) The Munchkin Zombies Guest Artist T-Shirt, with art by Greg Hyland: All he wants to do is give you hugs, but all people do is shriek and run away! Pity the poor zombie.